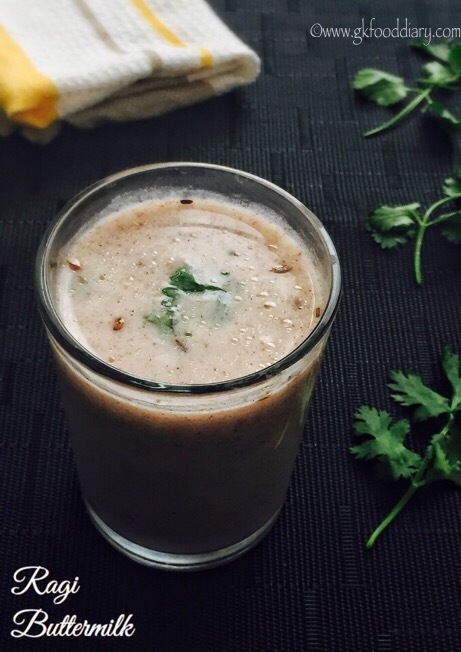 Ragi Buttermilk – an easy and cooling drink made with ragi/nachni/finger millet and curd/yogurt. Its a best refreshing summer drink for kids as it keeps the body cool and keep them hydrated. The method of making is too simple, cook the ragi flour , add butter milk and tempering when its cooled. Thats it! Do try this perfect drink this summer and update with your comments! This ragi butter milk can be given to toddlers as a drink from 1 year. 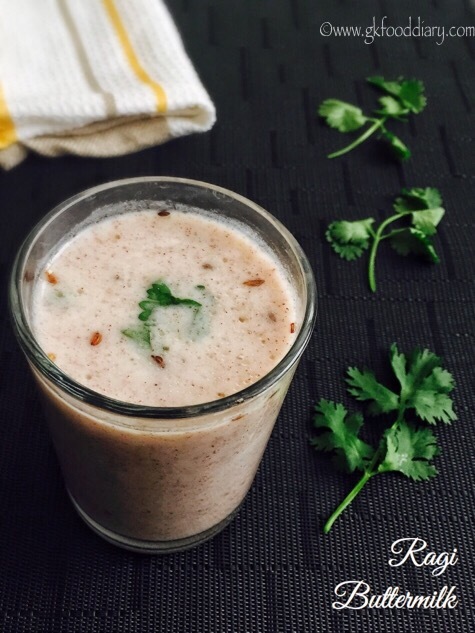 Now Let’s get on to check how to make this easy ragi buttermilk recipe for toddlers and kids. Measure ragi flour and curd. Chop coriander leaves finely. Keep it ready along with other ingredients. 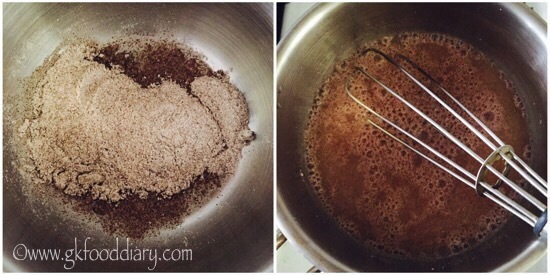 Take the ragi flour in a pan, add 1 cup of water. Mix it well with a whisk without any lumps. Cook the ragi flour in low flame for 8-10 minutes or until its thick and shiny. Switch off the flame once done and cool it down. 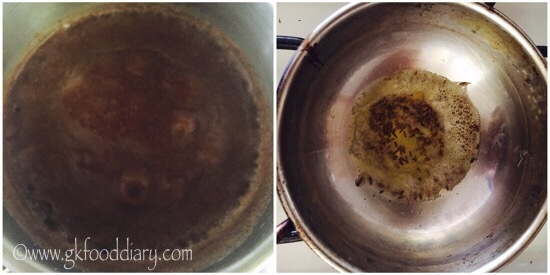 Heat ghee in a small pan, add cumin seeds and hing. Let the cumin seeds cracks. Switch it off once done. Set aside. 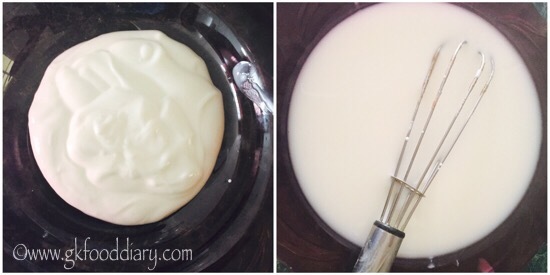 Take curd in a bowl and beat the curd well with a whisk. Then add 1 cup of water with salt and beat again until frothy. This is the butter milk. Keep it ready. 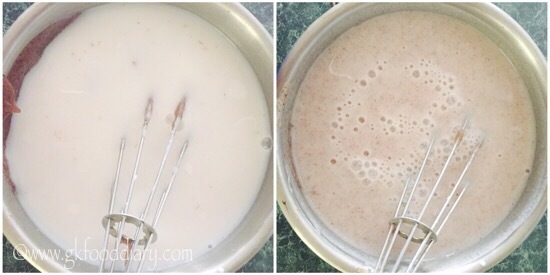 Once the cooked ragi flour is cooled down, add the prepared buttermilk to it. Mix it very well. Then add chopped coriander leaves and the tempering items. Mix everything together once again. 1. Measure ragi flour and curd. Chop coriander leaves finely. Keep it ready along with other ingredients. Take the ragi flour in a pan, add 1 cup of water. Mix it well with a whisk without any lumps. 2. Cook the ragi flour in low flame for 8-10 minutes or until its thick and shiny. Switch off the flame once done and cool it down. Heat ghee in a small pan, add cumin seeds and hing. Let the cumin seeds cracks. Switch it off once done. Set aside. 3. Take curd in a bowl and beat the curd well with a whisk. Then add 1 cup of water with salt and beat again until frothy. This is the butter milk. Keep it ready. 4. Once the cooked ragi flour is cool down completely, add the buttermilk to it. Mix it very well. 5. Then add chopped coriander leaves and the tempering items. Mix everything together once again. 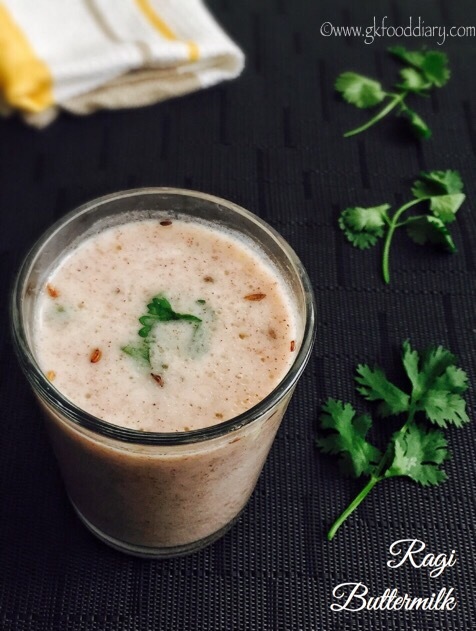 The ragi buttermilk is ready! Cook the ragi in low flame until the raw smell leaves. 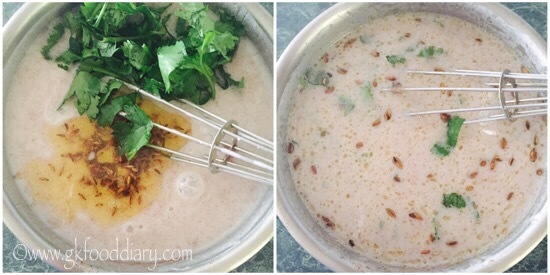 Make sure to add buttermilk only after the ragi is cooled down completely. Otherwise it gets curdled. The drink should be in pouring consistency, adjust water amount accordingly. You can also add grated ginger and green chilli while tempering. 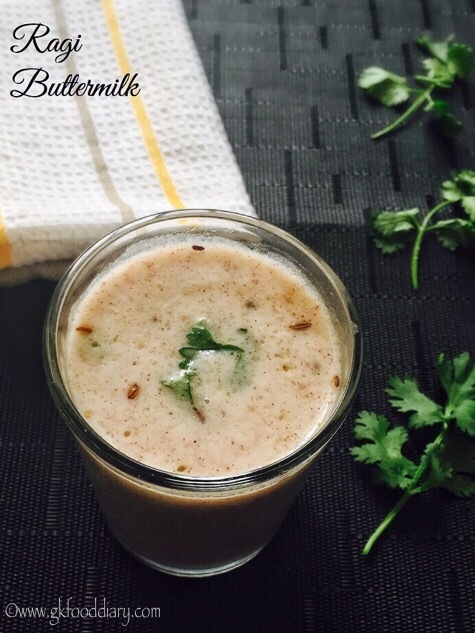 Make sure to introduce each ingredients separate to your baby, before you try this ragi buttermilk recipe.